Valentines day is just around the corner, roses is one of the flowers that will be given away. My husband gave me roses last valentines day with chocolate. Of course chocolate will be the first that is gone. As you know I am a chocoholic. 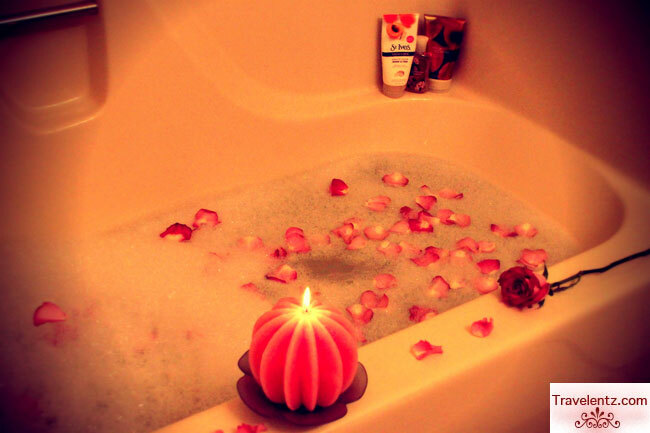 I used rose petals in my bubble bath. Instead of throwing the roses that had given to me. I usually find how to used it in simple ways. 1. Add a rose petals in your bubble bath-I got this idea when we checked in, the 5 star hotel in Thailand. 2. Make a crafts with your daughter when it is dry by hanging it first. 3. Add rose petals on your floating candles by sprinkling it-this idea, borrowed when I attended 18th birthday party of our friend.It was really pretty neat. Do you have any idea how to use wilted rose? ooohhhh... aromatic! love this shot. i should be doing this more often. i used to have scented bubble baths at least once a month, but seems like recently, i get bored lying in the tub for a long time. hehe! Ay! Bongga! You're a genius Mhie for thinking of putting into aromatic use the wilted roses. Sorry dinelete ko yong naunang post. Di ko na edit before ko pinublish eh may mali palang spelling, hehehe! What a beautifully serene image. I admire your creativity.